This new volume by a+t publishers is part of the Density series on collective housing. 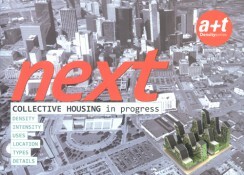 ‘Next’ focuses mainly on infills of the consolidated urban fabric. All projects have won first or second prizes in international competitions and fill in the existing city or regenerated urban voids with different former uses. 30 European and American projects by 29 different young architectural practices are analyzed; amongst these are BIG + Topotek1, atelier Kempe Thill, Maccreanor Lavington, and babled nouvet Reynaud.